As more companies adopt a bring-your-own-device (BYOD) working environment, awareness surrounding end-user security has continued to increase. How do employers ensure their data and network, accessed from multiple end-points, remains secure? And what is the best means of protecting employees from malicious vectors such as SPAM and malware? Microsoft Enterprise Mobility Suite + Security (EMS) was specifically designed to alleviate this concern. EMS is a management system that monitors and secures mobile devices while providing a single sign-on for mobile, SaaS, and on-premises apps such as Exchange and SharePoint. From compliance solutions to granular access levels, Intune ensures that your employees are working safely, wherever the job takes them. Restricting what users can do, in-app, with corporate information (such as copying/pasting, saving, and viewing). If a user wants to save information, it can only be done between secured locations. Removing company data from mobile apps in a process called "selective" or "corporate" wipe. This removal does not impact personal information stored on the device. Keeping personal information separate from corporate IT awareness. Intune allows employer data to be managed at the application-layer, eliminating the need to secure entire devices. Reflecting the diversity of employee platforms, Intune works for iOS, Android, Windows, and macOS devices. Devices must be enrolled for management: This allows company IT to measure device compliance, app inventory, and usage. Establish app protection policies: These policies outline how and to what degree user devices will be managed. This transparency fosters a more cyber-aware working environment and employee buy-in. Reliable security updates: Through mobile application management, apps are regularly configured and updated with the latest security and productivity features. Data loss prevention: Intune actively prevents accidental or intentional data corruption by requiring encryption for managed app storage. Beyond the in-app experience, Intune also allows for granular policies that outline conditional access. This role-based administrative control segments employees based on their position and assignments. Access can be determined/adjusted according to: device compliance, location, risk, and app sensitivity. End-user security can be further strengthened by implementing multi-factor authentication (MFA). Quick tip: Better cybersecurity begins with understanding all your options. Here are a few ways Microsoft EMS is helping businesses like yours. 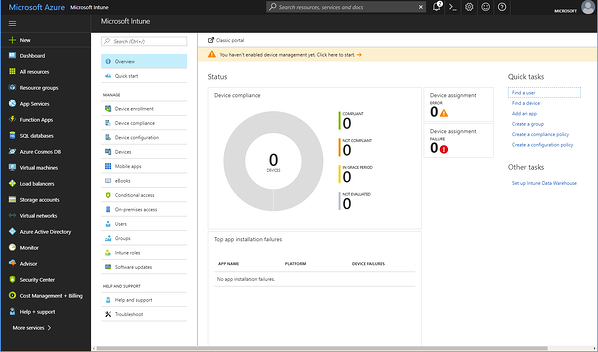 Intune is accessible via the Azure portal (pictured below). This provides an integrated dashboard for all EMS components, and allows employers to: find users, locate devices, set groups, create compliance and configuration policies, and manage on-premises and conditional access. These access settings leverage Azure Advanced Directory (AD) for integrated ease of use. Enforce policies to improve data security. Use behavior based analytics for proactive cybersecurity intelligence. Protect information from unauthorized access, both internal and external. Enhance the security of your cloud-based and on-premises environments. Why wait? Learn more about iCorps' Managed EMS Services today.